62445301681 ;jsessionid=10179yam90wybn1rq11eoz82zon0s3.10179?wicket:interface=:0:beta-club:modal-container:modal-content:content:body:login-rixty-form:visibilityContainer:fbconnect::IActivePageBehaviorListener:1:&wicket:ignoreIfNotActive=true It seems like your browser is preventing Facebook Authentication. This happens when your browser's Tracking Protection is enabled. To continue logging in via Facebook, please turn off Tracking Protection or use a different browser. 62445301681 ;jsessionid=10179yam90wybn1rq11eoz82zon0s3.10179?wicket:interface=:0:login-panel-small:login-small:login:modal-container:modal-content:content:body:login-rixty-form:visibilityContainer:fbconnect::IActivePageBehaviorListener:1:&wicket:ignoreIfNotActive=true It seems like your browser is preventing Facebook Authentication. This happens when your browser's Tracking Protection is enabled. To continue logging in via Facebook, please turn off Tracking Protection or use a different browser. 62445301681 ;jsessionid=10179yam90wybn1rq11eoz82zon0s3.10179?wicket:interface=:0:login-panel-small:login-small:signup:modal-container:modal-content:content:signup-form:fbconnect::IActivePageBehaviorListener:1:&wicket:ignoreIfNotActive=true It seems like your browser is preventing Facebook Authentication. This happens when your browser's Tracking Protection is enabled. To continue logging in via Facebook, please turn off Tracking Protection or use a different browser. 62445301681 ;jsessionid=10179yam90wybn1rq11eoz82zon0s3.10179?wicket:interface=:0:redeemcode:modal-container:modal-content:content:body:login-rixty-form:visibilityContainer:fbconnect::IActivePageBehaviorListener:1:&wicket:ignoreIfNotActive=true It seems like your browser is preventing Facebook Authentication. This happens when your browser's Tracking Protection is enabled. To continue logging in via Facebook, please turn off Tracking Protection or use a different browser. The Tell a Friend Program is designed to spread the word about the Rixty payment option that lets users pay for their online entertainment using cash. All Rixty users who have a Rixty account with a valid email address may participate. 62445301681 ;jsessionid=10179yam90wybn1rq11eoz82zon0s3.10179?wicket:interface=:0:details-login-link:modal-container:modal-content:content:body:login-rixty-form:visibilityContainer:fbconnect::IActivePageBehaviorListener:1:&wicket:ignoreIfNotActive=true It seems like your browser is preventing Facebook Authentication. This happens when your browser's Tracking Protection is enabled. To continue logging in via Facebook, please turn off Tracking Protection or use a different browser. to your Rixty account and go to the Tell a Friend page www.rixty.com/tellafriend or your account settings page. Use the sharing tools to forward your unique link to your friends and fellow gamers, or post it on your favorite social networking site. Once your friends click the link, they will be connected to your Rixty account. Once your friends click the link, they will be taken to the Rixty homepage. For each friend who signs up for Rixty and redeems $10 or more into their Rixty account, you will get a $1 credit in your account! Rixty reserves the right to change the terms and conditions governing the Tell a Friend Program or end the Tell a Friend program at any time. Each Rixty user is limited to 25 Tell a Friend bonus awards each month. 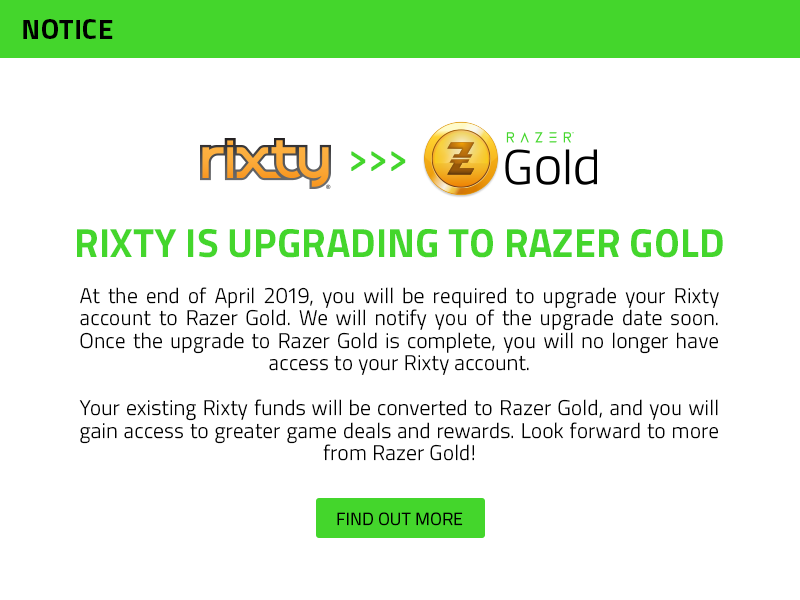 It is against the Rixty terms of service for an individual to create more than one Rixty account. If a user is suspected of creating more than one account, their account will be suspended, and all remaining Rixty value will be forfeited. For further information read the Rixty Terms & Conditions. For the referrer to receive credit, the referred user must have a valid Tell a Friend cookie, and must have signed up for Rixty and redeemed a minimum of $10.00 into their Rixty account within 30 days.